Abstract: The limited efficacy of the currently available medical therapies in a proportion of patients with Crohn’s disease has led to the research and development of molecules that can block new inflammatory pathways. Ustekinumab is a fully human IgG1 monoclonal antibody which targets the common p40 subunit of the cytokines interleukin-12 as well as interleukin-23. Consequently, the Th1 and Th17 inflammatory responses are inhibited. Ustekinumab has been recently approved for its use in patients with Crohn’s disease. Its efficacy and safety was initially proved in patients with psoriasis and psoriatic arthritis. More recently, three Phase III trials have confirmed its efficacy in patients with Crohn’s disease refractory to anti-tumor necrosis factor therapy. This biologic agent appears safe, with no increased risk of infectious or malignant complications, and a low immunogenic profile. Crohn’s disease (CD) is a chronic inflammatory disease that causes transmural inflammation of the gastrointestinal wall.1 The presence of chronic active inflammation can induce the development of bowel damage, such as stenosis and fistula. Multiple therapies are nowadays available for inducing and/or maintaining remission in CD: corticosteroids, immunomodulators (azathioprine, 6-mercaptopurine, and methotrexate), anti-tumor necrosis factor (anti-TNF) agents (infliximab, adalimumab, certolizumab pegol), and anti-integrin agents (natalizumab, vedolizumab). But their limited efficacy in some patients (primary nonresponders), loss of response over time (secondary nonresponders), or the occurrence of adverse events has led to the development of new molecules that target different inflammatory pathways. Ustekinumab (Stelara®; Janssen Biotech Inc., Horsham, PA, USA) is a monoclonal antibody which targets the common p40 subunit of the cytokines interleukin (IL)-12 and IL-23. The use of ustekinumab was initially approved for the treatment of patients with plaque psoriasis (2009) and psoriatic arthritis (2013). Recently, the US Food and Drug Administration together with the European Medicines Agency has also approved the use of ustekinumab for the treatment of moderate-to-severe active CD in patients aged ≥18 years.2,3 In the case of Europe, ustekinumab can be administered to patients who are refractory and/or intolerant to anti-TNF agents, or to those who have medical contraindications to such therapies. Multiple cytokines participate in the activation of the immune response in patients with immune-related diseases. Naïve CD4+T cells can differentiate into four main subsets: Th1, Th2, Th17, and regulatory T cells. The IL-12 family includes different cytokines that are key mediators of the inflammatory response, such as IL-12, IL-23, IL-27, and IL-35.4–6 They are produced by the antigen presenting cells – dendritic cells and macrophages – during intestinal inflammation in patients with CD. 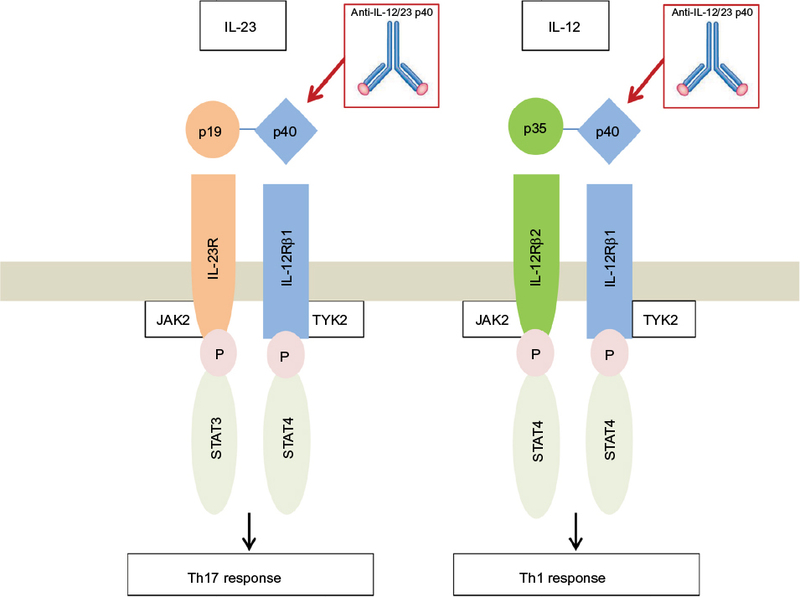 Figure 1 Schematic representation of IL-12 and IL-23 with their receptors and downstream signaling pathways. Abbreviations: IL, interleukin; STAT, Signal Transducer and Activator of Transcription. Patients with psoriasis were the first-in-human population who received ustekinumab and in whom pharmacokinetics was primarily studied.14 The pharmacokinetic characteristics of ustekinumab were comparable to those of human endogenous IgG1. Intravenous (IV) and subcutaneous (SC) administration of ustekinumab showed an extended elimination half-life of 3 weeks. Both administration routes had linear pharmacokinetic profiles. The highest concentration was detected in the serum 7–14 days after SC administration. Ustekinumab exhibited comparable pharmacokinetic profiles across the dermatologic, rheumatic, gastrointestinal, and central nervous system indications studied to date. No significant drug interaction has been described. In patients with CD, an initial IV induction dose based on body weight (6 mg/kg ustekinumab) is recommended, followed by SC ustekinumab administration. The first SC dose of 90 mg should take place at week 8 after the IV dose. Afterward, dosing every 12 weeks is recommended. Patients who do not show adequate response at week 8 (after the first SC dose) may receive a second SC dose at this time. Patients who lose response on dosing every 12 weeks may benefit from an increase in dosing frequency to every 8 weeks. Patients may subsequently be dosed every 8 weeks or every 12 weeks according to clinical judgment. No pharmacokinetic data are available either in elderly or pediatric patients with impaired renal or hepatic function. Psoriasis was the first-in-human indication of ustekinumab. This indication was based on Phase III trials conducted in North America and Europe (PHOENIX 1, PHOENIX 2, and ACCEPT), Korea and Taiwan (PEARL), and Japan (Japanese trial) that assessed the efficacy of ustekinumab in patients with moderate-to-severe psoriasis from different ethnic populations.15–19 The primary endpoint of these trials was the proportion of patients achieving improvement of at least 75% in psoriasis area and severity index at week 12. This index is a measure of overall psoriasis severity and extension of the lesions. In the PHOENIX 1 trial, 766 patients were randomly assigned to receive ustekinumab 45 or 90 mg (at weeks 0 and 4, and then every 12 weeks) or placebo (at weeks 0 and 4, with subsequent crossover to ustekinumab at week 12); 171 (67%) patients receiving ustekinumab 45 mg, 170 (66%) receiving ustekinumab 90 mg, and 8 (3%) receiving placebo achieved the primary endpoint.15 Patients receiving the monoclonal antibody presented statistically significant differences in response rates, compared to placebo: 64% of patients with ustekinumab 45 mg and 63% of patients with ustekinumab 90 mg (p<0.0001). Long-term response at week 40 was also assessed with a new randomization at week 40 to maintenance ustekinumab versus placebo. Response was also better in those patients who continued the treatment with ustekinumab (p<0.0001). The PHOENIX 2 trial included 1,230 patients who were randomly assigned to receive ustekinumab 45 or 90 mg (at weeks 0 and 4, then every 12 weeks) or placebo.16 Dose intensification was assessed in partial responders, as these patients were re-randomized at week 28 to continue dosing every 12 weeks or escalate to dosing every 8 weeks. 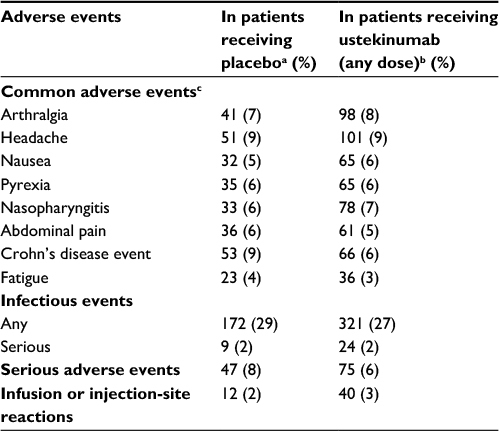 Treatment with ustekinumab every 12 weeks was effective for most patients: 273 (67%) patients receiving ustekinumab 45 mg, 311 (76%) patients receiving ustekinumab 90 mg, and 15 (4%) receiving placebo achieved the primary endpoint. Difference in response rate was 63% for the 45 mg group and 72% for the group of 90 mg (p<0.0001). After the dosing intensification to once every 8 weeks in partial responders, only the patients receiving a dose of 90 mg of ustekinumab achieved the primary endpoint (69% of patients receiving 90 mg every 8 weeks versus 33% of those who continued with the same dose every 12 weeks, with a difference in response rate of 35%, p=0.004). The ACCEPT study compared two biologic agents, ustekinumab and etanercept (an anti-TNF agent) for the treatment of psoriasis.17 The efficacy and safety of a crossover from etanercept to ustekinumab were also assessed after week 12. The efficacy of ustekinumab at dose 45 or 90 mg was superior to that of high-dose etanercept over a 12-week period: 68% patients receiving 45 mg ustekinumab and 74% of patients receiving 90 mg ustekinumab, compared to 57% of patients receiving etanercept reached the endpoint (p=0.01 and p<0.001, respectively). After the crossover, 50% of patients who had no response to etanercept reached the primary endpoint with ustekinumab. Efficacy of ustekinumab for the treatment of active psoriatic arthritis was also demonstrated in randomized clinical trials.20–22 After a crossover Phase II trial revealed that ustekinumab significantly reduced signs and symptoms of psoriatic arthritis compared to placebo, the Phase III PSUMMIT 1 trial randomized 615 patients with active psoriatic arthritis to 45 mg ustekinumab, 90 mg ustekinumab, or placebo at week 0, 4, and every 12 weeks.20,21 The primary endpoint was an improvement of ≥20% in the American College of Rheumatology response criteria at week 24. These criteria measure improvement in tender or swollen joint in at least three of the following parameters: patient assessment, physician assessment, pain scale, disability/functional questionnaire, and acute phase reactant. More patients who received ustekinumab (42% of patients with 45 mg dose, 50% of patients with 90 mg dose) achieved the primary endpoint when compared to placebo (23%; p<0.0001). Clinical responses were maintained at week 52. The PSUMMIT 2 trial assessed the efficacy and safety of ustekinumab every 12 weeks in patients with active psoriatic arthritis who had failed to respond to conventional and/or biologic anti-TNF agents.22 Patients with and without methotrexate (n=155 and n=157, respectively), who were naïve to anti-TNF agents (n=132), or who had failed to respond to anti-TNF therapy (n=180) were included. More ustekinumab-treated patients (43.8% combined) than placebo-treated ones (20.2%) achieved the primary endpoint at week 24 (p<0.001). A sustained efficacy was observed in patients who received ustekinumab after previous treatment with ≥1 anti-TNF agent. The Phase IIb CERTIFI trial evaluated the efficacy of ustekinumab in adults with moderate-to-severe active CD who had previously failed to respond to anti-TNF agents.24 The primary endpoint was clinical response (≥100 points reduction from baseline CD Activity Index [CDAI] score). At induction, 526 patients received a single IV ustekinumab infusion at doses of 1, 3, or 6 mg/kg versus placebo. The primary endpoint was reached in 36.6%, 34.1%, and 39.7% of cases receiving ustekinumab (for 1, 3, and 6 mg/kg ustekinumab, respectively), as compared with 23.5% for placebo (p=0.005 for the comparison with the 6 mg/kg group). There were no statistically significant differences in the rates of clinical remission (CDAI <150). During the maintenance phase, 145 patients with clinical response were re-randomized at week 8 to receive SC injections of ustekinumab 90 mg or placebo at weeks 8 and 16. Rates of clinical response and clinical remission were significantly increased with ustekinumab as compared with placebo (69.4% versus 42.5%, p<0.001 and 41.7% versus 27.4%, p=0.03, respectively) at week 22. The UNITI-1 trial included patients with CD who were refractory or intolerant to anti-TNF (n=741), and the UNITI-2 trial included patients with CD refractory or intolerant to conventional therapy, glucocorticoids, or immunomodulators (n=628). Patients were randomly assigned to receive a single IV dose of ustekinumab (130 mg), a weight-range-based dose of ustekinumab (6 mg/kg), or placebo. Clinical response at week 6 (decrease from baseline in CDAI score of ≥100 points or a CDAI score <150) was assessed. In both trials, those patients receiving ustekinumab had a significantly higher rate of response after 6 weeks than placebo: 34.3%, 33.7%, and 21.5%, respectively (p≤0.003) in UNITI-1 and 51.7%, 55.5%, and 28.7% respectively (p<0.001) in UNITI-2. Patients who completed the induction phase and had a clinical response to ustekinumab (n=397) were included in the IM-UNITI trial. They were randomly assigned to receive SC maintenance injections of ustekinumab (90 mg either every 8 weeks or every 12 weeks) or placebo. After 44 weeks, more patients receiving ustekinumab were in remission (CDAI score <150) than those receiving placebo: 53.1% and 48.8% of patients receiving ustekinumab every 8 weeks or every 12 weeks, as compared with 35.9% of those receiving placebo (p=0.005 and p=0.04, respectively). The main results of this trial are summarized in Table 1. Notes: Data from Feagan et al.25 UNITI-1 and -2, two induction trials; IM-UNITI, maintenance trial. Abbreviations: CDAI, Crohn’s Disease Activity Index; IV, intravenous; SC, subcutaneous; TNF, tumor necrosis factor. Moreover, ustekinumab appears to be highly effective in the treatment of the paradoxical psoriasis-like lesions induced by the use of anti-TNF agents in patients with CD.32–35 These are the most frequent dermatologic adverse effects in CD patients receiving anti-TNF agents. Pyoderma gangrenosum is a neutrophilic dermatitis characterized by cutaneous ulceration. It is believed that IL-23 is involved in its pathogenesis, as this cytokine promotes inflammation via IL-17 production and neutrophil recruitment. Several case reports have described the use of ustekinumab in treatment of this condition, including a case of peristomal pyoderma in a patient with CD.38–42 However, there is still lack of specific trials to assess the efficacy, appropriate dosing, and safety of ustekinumab for this indication. Most of the data on safety have been collected in patients with psoriasis, in which ustekinumab was first administered. Long-term follow-up studies on the use of ustekinumab in patients with moderate-to-severe psoriasis analyzed the safety profile in >3,000 patients and revealed a safe profile of the drug.43–46 Common adverse effects were headache, nasopharyngitis, upper respiratory tract infections, sinusitis, fatigue, pruritus, back pain, and arthralgia. No cases of tuberculosis or other severe infections were described. The most common non-gastrointestinal adverse effects in patients with CD in the CERTIFI trial included headache, arthralgia, and nasopharyingitis.24 Infection rates were similar in patients receiving ustekinumab as well as placebo. In the UNITI-1, UNITI-2, and IM-UNITI trials, 13 patients developed serious infections: 2.3% of patients in the group receiving ustekinumab every 8 weeks, 5.3% in the group receiving ustekinumab every 12 weeks, and 2.3% in the placebo group.25 The main adverse events in the UNITI trials are presented in Table 2. Notes: Data from Feagan et al.25 Adverse effects through week 8 in UNITI-1 and UNITI-2 and through week 44 in IM-UNITI. aNumber of patients receiving placebo: n=245 in UNITI-1; n=208 in UNITI-2; n=133 in IM-UNITI. bNumber of patients receiving ustekinumab (any dose): n=495 in UNITI-1; n=419 in UNITI-2; n=263 in IM-UNITI. cThe common adverse events were reported by at least 5% of the patients in any group. UNITI-1 and -2, two induction trials; IM-UNITI, maintenance trial. Regarding the risk of malignancies, Phase II and III trials on psoriatic patients are reassuring about the long-term safety of ustekinumab.44 Three of four malignancies reported in ustekinumab-treated patients and two of the three malignancies reported in placebo-treated patients were non-melanoma skin cancers (NMSCs). In the long-term follow-up studies of ustekinumab on psoriasis, the pattern of NMSC was similar to that observed in psoriasis clinical trials of other biologics.43–46 The rates of malignancies other than NMSC in ustekinumab-treated patients were comparable with the expected rates in the general population. In the CERTIFI trial in patients with CD, one case of NMSC developed in a patient receiving ustekinumab.24 Eight cases of NMSC were reported in the IM-UNITI trial, with three of them in patients receiving placebo.25 One patient receiving ustekinumab every 12 weeks developed a metastatic adenocarcinoma in the small bowel, and a carcinoid tumor was found incidentally in the resected bowel. In patients with CD, rates of antibodies to ustekinumab across the Phase III trials were low, ranging from 3.8% to 5.4%; also, the presence of antibodies was not associated with the occurrence of injection site reactions.25 The correlation of ustekinumab trough concentrations with clinical, biologic, and endoscopic responses in patients with CD-refractory anti-TNF has only been analyzed in a cohort of 62 patients.62 Patients with concentrations >4.5 µg/mL presented better clinical and endoscopic outcomes, but larger studies are required to confirm the optimal therapeutic concentration. There are insufficient data to recommend ustekinumab in pregnancy and breast feeding. Current evidence does not indicate an increase rate of congenital malformations in children born from mothers using ustekinumab during pregnancy in patients with dermatologic or rheumatic disease.63,64 No data are available regarding its use while breast feeding. Regarding CD, no meta-analysis reports on the safety of ustekinumab during pregnancy are available. Only two case reports of patients with CD under maintenance therapy with ustekinumab before pregnancy have been reported.65,66 The patients maintained remission of CD, and no adverse effects were observed during pregnancy and they gave birth to healthy children. Ustekinumab is a fully human monoclonal antibody directed against the p40 subunit of IL-12 and IL-23 that has been exhaustively investigated for the treatment of psoriasis and psoriatic arthritis, where it appears to be safe and effective. It has been recently approved for its use in patients with CD. Current evidence in CD shows positive results of ustekinumab in patients refractory to anti-TNF agents, with significantly increased rates of clinical response and remission compared to placebo. In addition, ustekinumab has a favorable safety profile, as it does not increase the risk of infections and malignancies, and shows low rates of development of anti-drug antibodies. Moreover, ustekinumab is also effective for the treatment of psoriasis-like paradoxical lesions induced by anti-TNF agents. However, data on perianal disease or extraintestinal manifestations of CD, as well as long-term data on safety and clinical/endoscopic efficacy should be obtained in the coming years. It is not clear whether the efficacy of ustekinumab is driven by the inhibition of IL-12 or IL-23. Moreover, inhibition of the IL-12 pathway could have potential risks in tumor immune surveillance and host defense against intracellular pathogens. Several new agents that induce a selective blockade of IL-23 are currently being developed. Risankinumab is a humanized monoclonal antibody that selectively targets the specific p19 subunit of IL-23.72 Recently published Phase II studies on the use of risankinumab for the treatment of patients with psoriasis and CD have shown promising results.73,74 The results of Phase III trials will determine the efficacy and safety profile of this new molecule. Gomollón F, Dignass A, Annese V, et al. 3rd European evidence-based consensus on the diagnosis and management of Crohn’s Disease 2016: Part 1: diagnosis and medical management. J Crohns Colitis. 2017;11(1):3–25. FDA Product Information. Approval of ustekinumab for Crohn’s disease. 2016. Available from: https://www.accessdata.fda.gov/drugsatfda_docs/appletter/2016/761044Orig1s000ltr.pdf. EMA Product information. Approval of ustekinumab for Crohn’s disease. 2016. Available from: http://www.ema.europa.eu/docs/en_GB/document_library/EPAR_Product_Information/human/000958/WC500058513.pdf. Cua DJ, Sherlock J, Chen Y, et al. Interleukin-23 rather than interleukin-12 is the critical cytokine for autoimmune inflammation of the brain. Nature. 2003;421(6924):744–748. Teng MW, Bowman EP, McElwee JJ, et al. IL-12 and IL-23 cytokines: from discovery to targeted therapies for immune-mediated inflammatory diseases. Nat Med. 2015;21(7):719–729. Neurath MF, Fuss I, Kelsall BL, Stüber E, Strober W. Antibodies to interleukin 12 abrogate established experimental colitis in mice. J Exp Med. 1995;182(5):1281–1290. Uhlig HH, McKenzie BS, Hue S, et al. Differential activity of IL-12 and IL-23 in mucosal and systemic innate immune pathology. Immunity. 2006;25(2):309–318. Tozawa K, Hanai H, Sugimoto K, et al. Evidence for the critical role of interleukin-12 but not interferon-gamma in the pathogenesis of experimental colitis in mice. J Gastroenterol Hepatol. 2003;18(5):578–587. Yen D, Cheung J, Scheerens H, et al. IL-23 is essential for T cell-mediated colitis and promotes inflammation via IL-17 and IL-6. J Clin Invest. 2006;116(5):1310–1316. Izcue A, Hue S, Buonocore S, et al. Interleukin-23 restrains regulatory T cell activity to drive T cell-dependent colitis. Immunity. 2008;28(4):559–570. Ahern PP, Schiering C, Buonocore S, et al. Interleukin-23 drives intestinal inflammation through direct activity on T Cells. Immunity. 2010;33(2):279–288. Benson JM, Sachs CW, Treacy G, et al. Therapeutic targeting of the IL-12/23 pathways: generation and characterization of ustekinumab. Nat Biotechnol. 2011;29(7):615–624. Leonardi CL, Kimball AB, Papp KA, et al; PHOENIX1 study investigators. Efficacy and safety of ustekinumab, a human interleukin-12/23 monoclonal antibody, in patients with psoriasis: 76-week results from a randomised, double-blind, placebo-controlled trial (PHOENIX 1). Lancet. 2008;371(9625):1665–1674. Papp KA, Langley RG, Lebwohl M, et al; PHOENIX 2 study investigators. Efficacy and safety of ustekinumab, a human interleukin-12/23 monoclonal antibody, in patients with psoriasis: 52-week results from a randomised, double-blind, placebo-controlled trial (PHOENIX 2). Lancet. 2008;371(9625):1675–1684. Griffiths CE, Strober BE, van de Kerkhof P, et al; ACCEPT Study Group. Comparison of ustekinumab and etanercept for moderate-to-severe psoriasis. N Engl J Med. 2010;362(2):118–128. Tsai TF, Ho JC, Song M, et al; PEARL Investigators. Efficacy and safety of ustekinumab for the treatment of moderate-to-severe psoriasis: a phase III, randomized, placebo-controlled trial in Taiwanese and Korean patients (PEARL). J Dermatol Sci. 2011;63(3):154–163. Igarashi A, Kato T, Kato M, Song M, Nakagawa H; Japanese Ustekinumab Study Group. Efficacy and safety of ustekinumab in Japanese patients with moderate-to-severe plaque-type psoriasis: Long-term results from a phase 2/3 clinical trial. J Dermatol. 2012;39(3):242–252. McInnes IB, Kavanaugh A, Gottlieb AB, et al. Efficacy and safety of ustekinumab in patients with active psoriatic arthritis: 1 year results of the phase 3, multicentre, double-blind, placebo-controlled PSUMMIT 1 trial. Lancet. 2013;382(9894):780–789. Ritchlin C, Rahman P, Kavanaugh A, et al; PSUMMIT 2 Study Group. Efficacy and safety of the anti-IL-12/23 p40 monoclonal antibody, ustekinumab, in patients with active psoriatic arthritis despite conventional non-biological and biological anti-tumour necrosis factor therapy: 6-month and 1-year results of the phase 3, multicentre, double-blind, placebo-controlled, randomised PSUMMIT 2 trial. Ann Rheum Dis. 2014;73(6):990–999. Kavanaugh A, Ritchlin C, Rahman P, et al; PSUMMIT-1 and 2 Study Groups. Ustekinumab, an anti-IL-12/23 p40 monoclonal antibody, inhibits radiographic progression in patients with active psoriatic arthritis: results of an integrated analysis of radiographic data from the phase 3, multicentre, randomised, double-blind, placebo-c. Ann Rheum Dis. 2014;73(6):1000–1006. Sandborn WJ, Gasink C, Gao LL, et al; CERTIFI Study Group. Ustekinumab induction and maintenance therapy in refractory Crohn’s disease. N Engl J Med. 2012;367(16):1519–1528. Feagan BG, Sandborn WJ, Gasink C, et al; UNITI–IM-UNITI Study Group. Ustekinumab as Induction and Maintenance Therapy for Crohn’s Disease. N Engl J Med. 2016;375(20):1946–1960. MacDonald JK, Nguyen TM, Khanna R, Timmer A. Anti-IL-12/23p40 antibodies for induction of remission in Crohn’s disease. Cochrane Database Syst Rev. 2016;11:CD007572. Kopylov U, Afif W, Cohen A, et al. Subcutaneous ustekinumab for the treatment of anti-TNF resistant Crohn’s disease-The McGill experience. J Crohn’s Colitis. 2014;8(11):1516–1522. Wils P, Bouhnik Y, Michetti P, et al; Groupe d’Etude Thérapeutique des Affections Inflammatoires du Tube Digestif. Subcutaneous ustekinumab provides clinical benefit for two-thirds of patients with Crohn’s disease refractory to anti-tumor necrosis factor agents. Clin Gastroenterol Hepatol. 2016;14(2):242–250.e1–e2. Harris KA, Horst S, Gadani A, et al. Patients with refractory Crohn’s disease successfully treated with Ustekinumab. Inflamm Bowel Dis. 2016;22(2):397–401. Toedter GP, Blank M, Lang Y, Chen D, Sandborn WJ, de Villiers WJ. Relationship of C-reactive protein with clinical response after therapy with ustekinumab in Crohn’s disease. Am J Gastroenterol. 2009;104(11):2768–2773. Ma C, Fedorak RN, Kaplan GG, et al. Clinical, endoscopic and radiographic outcomes with ustekinumab in medically-refractory Crohn’s disease: real world experience from a multicentre cohort. Aliment Pharmacol Ther. 2017;45(9):1232–1243. Sansó Sureda A, Rocamora Durán V, Sapiña Camaró A, Royo Escosa V, Bosque López MJ. Ustekinumab in a patient with Crohn’s disease and anti-TNFα induced psoriasis. Gastroenterol Hepatol. 2011;34(8):546–550. Andrisani G, Marzo M, Celleno L, et al. Development of psoriasis scalp with alopecia during treatment of Crohn’s disease with infliximab and rapid response to both diseases to ustekinumab. Eur Rev Med Pharmacol Sci. 2013;17(20):2831–2836. Tillack C, Ehmann LM, Friedrich M, et al. Anti-TNF antibody-induced psoriasiform skin lesions in patients with inflammatory bowel disease are characterised by interferon-gamma-expressing Th1 cells and IL-17A/IL-22-expressing Th17 cells and respond to anti-IL-12/IL-23 antibody treatment. Gut. 2014;63(4):567–577. Suh HY, Ahn JY, Park MY, Youn JI. Exacerbation of infliximab-induced paradoxical psoriasis after ustekinumab therapy. J Dermatol. Epub 2017 Mar 11. Segal BM, Constantinescu CS, Raychaudhuri A, Kim L, Fidelus-Gort R, Kasper LH; Ustekinumab MS Investigators. Repeated subcutaneous injections of IL12/23 p40 neutralising antibody, ustekinumab, in patients with relapsing-remitting multiple sclerosis: a phase II, double-blind, placebo-controlled, randomised, dose-ranging study. Lancet Neurol. 2008;7(9):796–804. Longbrake EE, Racke MK. Why did IL-12/IL-23 antibody therapy fail in multiple sclerosis? Expert Rev Neurother. 2009;9(3):319–321. Goldminz AM, Botto NC, Gottlieb AB. Severely recalcitrant pyoderma gangrenosum successfully treated with ustekinumab. J Am Acad Dermatol. 2012;67(5):e237–e238. Greb JE, Gottlieb AB, Goldminz AM. High-dose ustekinumab for the treatment of severe, recalcitrant pyoderma gangrenosum. Dermatol Ther. 2016;29(6):482–483. Fahmy M, Ramamoorthy S, Hata T, Sandborn WJ. Ustekinumab for peristomal pyoderma gangrenosum. Am J Gastroenterol. 2012;107(5):794–795. Lebwohl M, Leonardi C, Griffiths CE, et al. Long-term safety experience of ustekinumab in patients with moderate-to-severe psoriasis (Part I of II): results from analyses of general safety parameters from pooled phase 2 and 3 clinical trials. J Am Acad Dermatol. 2012;66(5):731–741. Kimball AB, Papp KA, Wasfi Y, et al; PHOENIX 1 Investigators. Long-term efficacy of ustekinumab in patients with moderate-to-severe psoriasis treated for up to 5 years in the PHOENIX 1 study. J Eur Acad Dermatology Venereol. 2013;27(12):1535–1545. Langley RG, Lebwohl M, Krueger GG, et al; PHOENIX 2 Investigators. Long-term efficacy and safety of ustekinumab, with and without dosing adjustment, in patients with moderate-to-severe psoriasis: results from the PHOENIX 2 study through 5 years of follow-up. Br J Dermatol. 2015;172(5):1371–1383. Papp K, Gottlieb AB, Naldi L, et al. Safety surveillance for ustekinumab and other psoriasis treatments fthe psoriasis longitudinal assessment and registry (PSOLAR). J Drugs Dermatol. 2015;14(7):706–714. Kalb RE, Fiorentino DF, Lebwohl MG, et al. Risk of serious infection with biologic and systemic treatment of psoriasis. JAMA Dermatol. 2015;151(9):961–969. Gómez-García F, Epstein D, Isla-Tejera B, Lorente A, Vélez García-Nieto A, Ruano J. Short-term efficacy and safety of new biologic agents targeting IL -23/Th17 pathway for moderate to severe plaque psoriasis: a systematic review and network meta -analysis. Br J Dermatol. 2017;176(3):594–603. Mocko P, Kawalec P, Pilc A. Safety profile of biologic drugs in the therapy of Crohn disease: A systematic review and network meta-analysis. Pharmacol Rep. 2016;68(6):1237–1243. Hanauer SB, Feagan BG, Lichtenstein GR, et al; ACCENT I Study Group. Maintenance infliximab for Crohn’s disease: the ACCENT I randomised trial. Lancet. 2002;359(9317):1541–1549. Sands BE, Anderson FH, Bernstein CN, et al. Infliximab maintenance therapy for fistulizing Crohn’s disease. N Engl J Med. 2004;350(9):876–885. Regueiro M, Schraut W, Baidoo L, et al. Infliximab prevents Crohn’s disease recurrence after ileal resection. Gastroenterology. 2009;136(2):441–450. Watanabe M, Hibi T, Lomax KG, et al; Study Investigators. Adalimumab for the induction and maintenance of clinical remission in Japanese patients with Crohn’s disease. J Crohn’s Colitis. 2012;6(2):160–173. Sandborn WJ, Hanauer SB, Rutgeerts P, et al. Adalimumab for maintenance treatment of Crohn’s disease: results of the CLASSIC II trial. Gut. 2007;56(9):1232–1239. Sandborn WJ, Feagan BG, Rutgeerts P, et al; GEMINI 2 Study Group. Vedolizumab as induction and maintenance therapy for Crohn’s disease. N Engl J Med. 2013;369(8):711–721. Sands BE, Feagan BG, Rutgeerts P, et al. Effects of vedolizumab induction therapy for patients with Crohn’s disease in whom tumor necrosis factor antagonist treatment had failed. Gastroenterology. 2014;147(3):618–627.e3. Sandborn WJ, Schreiber S, Feagan BG, et al. Certolizumab pegol for active Crohn’s disease: a placebo-controlled, randomized trial. Clin Gastroenterol Hepatol. 2011;9(8):670–678. Badat Y, Meissner WG, Laharie D. Demyelination in a patient receiving ustekinumab for refractory Crohn’s disease. J Crohns Colitis. 2014;8(9):1138–1139. Rungapiromnan W, Yiu ZZN, Warren RB, Griffiths CEM, Ashcroft DM. Impact of biologic therapies on risk of major adverse cardiovascular events in patients with psoriasis: systematic review and meta-analysis of randomised controlled trials. Br J Dermatol. 2017;176(4):890–901. Battat R, Kopylov U, Bessissow T, et al. Association between ustekinumab trough concentrations and clinical, biomarker, and endoscopic outcomes in patients with Crohn’s disease. Clin Gastroenterol Hepatol. 2017;15(9):1427–1434.e2. Brown SM, Aljefri KA, Waas R, Hampton PJ. Systemic medications used in treatment of common dermatological conditions: safety profile with respect to pregnancy, breast feeding and content in seminal fluid. J Dermatolog Treat. Epub 2017 Jan 16. Götestam Skorpen C, Hoeltzenbein M, Tincani A, et al. The EULAR points to consider for use of antirheumatic drugs before pregnancy, and during pregnancy and lactation. Ann Rheum Dis. 2016;75(5):795–810. Galli-Novak E, Mook SC, Büning J, et al. Successful pregnancy outcome under prolonged ustekinumab treatment in a patient with Crohn’s disease and paradoxical psoriasis. J Eur Acad Dermatol Venereol. 2016;30(12):e191–e192. Cortes X, Borrás-Blasco J, Antequera B, et al. Ustekinumab therapy for Crohn’s disease during pregnancy: a case report and review of the literature. J Clin Pharm Ther. 2017;42(2):234–236. Bishop C, Simon H, Suskind D, Lee D, Wahbeh G. Ustekinumab in pediatric Crohn disease patients. J Pediatr Gastroenterol Nutr. 2016;63(3):348–351. Rinawi F, Rosenbach Y, Assa A, Shamir R. Ustekinumab for resistant pediatric Crohn’s disease. J Pediatr Gastroenterol Nutr. 2016;62(4): e34–e35. Cameron FL, Garrick V, Russell RK. Ustekinumab in treatment of refractory paediatric Crohn disease. J Pediatr Gastroenterol Nutr. 2016; 62(3):e30. Hayashi M, Umezawa Y, Fukuchi O, Ito T, Saeki H, Nakagawa H. Efficacy and safety of ustekinumab treatment in elderly patients with psoriasis. J Dermatol. 2014;41(11):974–980. Garber C, Plotnikova N, Au SC, Sorensen EP, Gottlieb A. Biologic and conventional systemic therapies show similar safety and efficacy in elderly and adult patients with moderate to severe psoriasis. J Drugs Dermatol. 2015;14(8):846–852. Singh S, Kroe-Barrett RR, Canada KA, et al. Selective targeting of the IL23 pathway: Generation and characterization of a novel highaffinity humanized anti-IL23A antibody. MAbs. 2015;7(4):778–791. Papp KA, Blauvelt A, Bukhalo M, et al. Risankizumab versus ustekinumab for moderate-to-severe plaque psoriasis. N Engl J Med. 2017;376(16):1551–1560. Feagan BG, Sandborn WJ, D’Haens G, et al. Induction therapy with the selective interleukin-23 inhibitor risankizumab in patients with moderate-to-severe Crohn’s disease: a randomised, double-blind, placebo-controlled phase 2 study. Lancet. 2017;389(10080):1699–1709.